Listen… with this one word at the beginning of St. Benedict’s Rule for Monasteries, Benedict began a revolution which led others to enter a process of conversion. A conversion of people’s hearts and minds and spirit. A conversion in which individuals answered an inner call which God wanted them to respond to and pursue. A revolution which is still going on because God is always calling. Listen… is still a powerful word especially to people who are discerning a monastic call, a monastic vocation. When we listen, the human heart hears the call of God, and a process of conversion begins: we surrender our will and say ‘yes’ to a God who loves us. 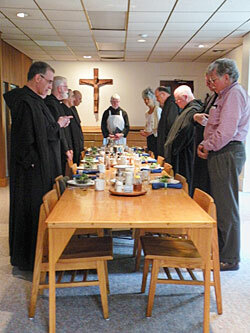 A process is begun rich with possibilities for the individual, the monastic community, and the Church. Listen… isn’t a word which our society gravitates toward. Most people are afraid to listen because of what they may hear. However, it is a prerequisite for monastic discernment, monastic vows, monastic life and anyone who is willing to follow the call, God’s call. For a glimpse of what monastic life is like and why someone might become a monk please watch this video clip featuring Br. Daniel Walters, OSB. For a more in depth overview of Glastonbury Abbey, please click here to view a 10-minute video.